Boa constrictors typically reach an adult length of 8-9 feet and up to 60 pounds, according to The Urban Python. Despite their size, boa constrictors are docile and nocturnal, making them a good choice for both novice and experienced snake owners. One of the most common issues with which new owners struggle is feeding. In the wild, boa constrictors eat a variety of small animals. Their preferred food is bats, but they also consume large lizards, birds, rats and squirrels, according to the National Zoo website. 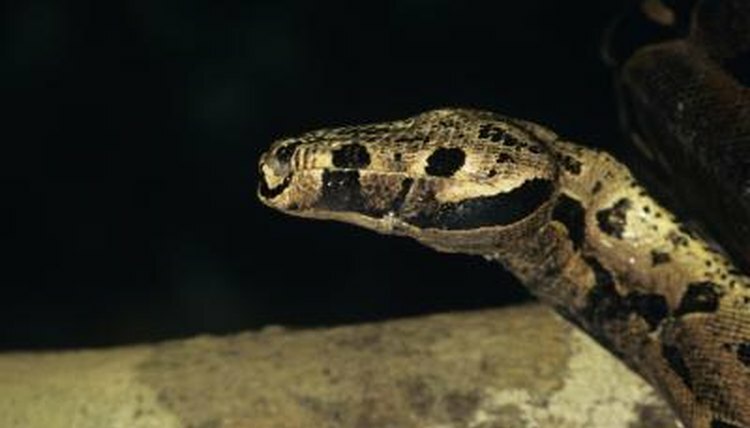 In captivity, boa constrictors are typically fed rodents, although the National Zoo supplements its boas’ diets with chicks. Boas in the wild kill their food by constricting around it, but feeding live animals to snakes in captivity is controversial. If your boa doesn't kill a prey animal right away, the animal might fight back and injure the snake. In addition, some snake owners feel that a quick, clean kill is more humane. The Herp Center Network recommends feeding only frozen rodents that have been thawed to room temperature. These rodents are readily available through mail order and at reptile supply shops. The Urban Python recommends feeding juvenile boa constrictors once per week and adults once every 10-14 days. Boas won't eat if they aren't hungry, especially during shedding or illness. Missing an occasional feeding is fine, but the Red-Tail Boa FAQ suggests taking a boa that has not eaten for three weeks to the vet. The size of the food should be proportional to the size of the snake. Choose a rodent that is approximately the same girth as the snake. Baby boas typically begin with pinkie mice, which are babies who do not yet have fur, while full-grown adults generally eat large rats. Feed only one prey item at each feeding. Thaw frozen rodents in a zip-top bag submerged in warm, but not hot, water for 15-30 minutes depending on the rodent’s size. Use a pair of tongs to present the prey to the snake. Never hand-feed your boa constrictor, as your snake could learn to associate your hands with food, leading to injury. Do not handle a snake that has recently eaten. According to The Urban Python, boa constrictors need at least 48 hours to properly digest a meal. Provide a dark, sheltered spot in the cage for the snake to curl up out of view, and leave it alone. You can perform minimal cage maintenance if necessary, but save major tasks for another time. What Kind of Mice are Feeder Mice?